It is now October, meaning that the SME Assembly 2018 is just around the corner. Next month we will be travelling to current European Presidency country Austria to the beautiful city of Graz for the flagship conference of the European SME Week. As the SME Assembly gets closer, be sure to keep checking the News Portal and all the social media for updates, important information and exclusive behind the scenes content. In this edition we will be looking at the EEPA 2018 European shortlist, and finding out more about the projects competing for a European prize. We are also proud to announce some of the younger guests of the SME Assembly 2018, the top three Youth Essay Competition finalists! We hope you enjoy this edition and make sure to follow us on the journey to Graz and our live coverage from the SME Assembly. Youth Essay Competition 2018 – Who is going to Graz? Today is the day that we all find out who is going to Graz to the SME Assembly 2018 from the European SME Week Youth Essay Competition! Firstly, a big thank you to everyone that submitted an entry for this year’s Essay Competition. The standard was very high and the jury spent lots of time and effort deliberating the shortlist, which was then narrowed down to the final top three candidates. These entries were of a high quality and received much praise from the judges, so congratulations on being on the shortlist! So who will be this year’s winner? We look forward to meeting the top three and finding out next month in Graz! The Youth Essay Competition jury would also like to give a special mention to Vincent Straub from Germany. The jury were only able to select three finalists, but felt that his essay was very strong and well written and as such deserved recognition. The 2018 SME Week Youth Essay Competition deadline is getting closer and we are still looking for more entries. But how can you be sure that the competition jury will like your entry? Promoting Enterprise is here to help! Today on the News Portal SME Week Youth Essay Competition jury member Mervi Pänkäläinen, Ideas from Europe 2017-2018 finalist, is sharing what she will be looking for in an entry, how she will judge an entry and very importantly what will make an entry stand out for her. What will you be looking for in an entry? I am especially looking forward to hearing the person’s own voice. Through their essay, I want to learn about their own experiences, observations and learnings and how those have been combined into the bigger picture. What are the top 3 criteria you will base your judging on? Passion and purpose, I want to know why this matters to you. What will make an entry stand out for you? An entry will stand out if it had a strong personal touch and insights that only a young person can deliver. I am really looking forward to learning from these young people! What advice would you give for those still not sure about entering the competition? Organising your thoughts and putting them down in words is always a great exercise for the mind. There is no “wrong” way of doing this. We want to know how you see the world, what you think about it and how it could work better. It’s your thinking and ideas that matter and we are eager to hear those! Avoid trying to sound like an experienced government official, let your own words be heard. What steps do you think should be taken to foster and encourage innovation? True innovation can only happen in a safe environment. “Psychological safety” is a term and state of mind that I pay a lot attention to. We can design an endless number of processes to boost innovation, but unless the culture actually makes people feel good and relaxed about themselves and others in the team, the processes are wasted. We need informal opportunities to bring different people and perspectives together, offer clearly framed challenges to work on and leadership – not management – to make it all happen. Humour is an asset that is rarely intentionally used, but that can be key to creating psychological safety. Interested in entering this year’s competition? 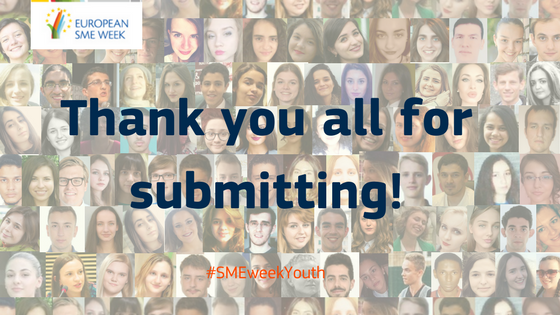 Find out more about the 2018 SME Week Youth Essay Competition right here! Keep coming back to the News Portal to find out more about the competition and all of the jury members, and don’t forget to submit your essays by 23 September 2018. Today on Promoting Enterprise we are catching up with 2016 Youth Essay Competition winner Andri Pandoura! At the age of 16 Andri won the competition two years ago during the first edition with her answer to “What can the EU do to encourage more young people to become entrepreneurs?”. Read on to find out what she has been up to since winning, her take on what it’s like being a part of the competition and her advice for the 2018 competitors. What have you been doing since winning the Youth Essay Competition? Well, I am still in high school with one more year to go, so lots of stressing about homework, as well as preparations for my university applications. Apart from that, I am still trying to be active in different programs. For instance, I am currently a Youth Ambassador for Structured Dialogue in Cyprus, as well as the Youth Delegate for Cyprus at the Congress of Local and Regional Authorities. Basically, I’m trying to keep myself busy. Do you have any exciting projects that you would like to share? A project that I am really excited and honoured to be a part of is “Children as Actors for Transforming Society” (CATS) that takes place in Caux, Switzerland. Every year children, NGOs, schools, youth groups and many more individuals with different levels of experience regarding child participation meet at Caux, stressing the key role of children as not only the future, but also the present. Specifically, all these people with vastly different backgrounds will come together under the umbrella theme of combatting violence in all forms, affecting children and working towards a safer world. It truly is an incredible project, promoting child rights and child participation at its best, in a similar way that the Youth Essay Competition promotes youth participation and allows young people to voice their views about topics that matter to them. What was the best part about entering the Youth Essay Competition? The chance to sit down and actually break down a topic such as Youth Entrepreneurship that at first glance appears to be a massive maze with no way out. The Competition gives all the participants, myself included, the chance to voice our opinions about a topic that is rarely discussed in the formal education system, but is of great importance. So really the best part of the competition was its role as an ‘amplifier’ that helps young people in being heard. Having the chance to participate and speak at the SME Assembly in 2016 allowed me to meet so many incredible individuals, hear different perspectives and opinions on youth entrepreneurship that I never really considered and truly opened new doors for me back home. What did you learn from the Youth Essay Competition experience? Most importantly, I learned how significant it is to make an effort and submit an essay, despite any doubts; I never would have imagined that my essay would win and this attitude of ‘try, even if you might not succeed’ has stuck with me ever since. I overcame my stage fright and learned from first-hand experience that there are people who want to hear your opinions and, even if they don’t initiate a conversation, you can always approach them yourself. Do you have any advice on how to approach this year’s question? I think that the best advice I could offer is to take it easy. It is a very interesting question, but it can also be quite daunting. I would suggest treating it as if you were having a discussion with a close friend or relative. Don’t get caught up in the technicalities, just write as if you are talking to someone. We often say “If I were in charge, I would…” and I believe this is the mind-set that will really help in brainstorming. When you get your main points down you can work with that and edit accordingly. Do you have any advice for the 2018 competitors? To write from experience is very important in my opinion. I remember feeling uncertain about participating since I was only 16 at the time and obviously lacked the experience and expertise of a university graduate, for instance. My advice is, don’t let any feelings of ‘inferiority’ get you down. The topic of innovation in entrepreneurship and government is not something limited to young entrepreneurs and politicians, and it is not expected of the competitors to fake a certain perspective. Write sincerely and this will shine through. Calling all 18-25 year olds, the European Commission wants to hear your voice! By taking part in the Youth Essay Competition you have a chance to share your thoughts and opinions with key policymakers and entrepreneurs on a European platform. Sound interesting? In order to win the prize of an all-expenses paid trip to the 2018 SME Assembly in Graz, submit an essay of no more than 2 500 words in English before 23 September 2018. To get started, read through the rules below, get writing and SUBMIT! If you have any questions please contact smeweek@loweurope.eu. See Youth Essay Competition 2018 Terms and Conditions. Less than a week to go until the start of the SME Assembly 2017! We’ve been telling you to get ready, shown you the programme, introduced the venue and given a few sneak peeks at what to expect from the assembly…so what is left? Today we share with you the final programme and a quick re-cap of everything to have a look at and look forward to next week in Tallinn. Be sure to check out the latest version of the programme here for a look at the policy sessions, masterclasses, presentations and much more. One of the big events at the SME Assembly 2017 will be the final European Enterprise Awards (EEPA) Ceremony where the European winners across all the different categories will be announced. All of the national winners as well as the EEPA shortlist have been introduced here on the Promoting Enterprise News Portal, but don’t worry if you can not remember who is competing, have a look right here. Interested in who judged all of these entries and selected the Grand Jury Prize winner? Re-meet the EEPA 2017 Jury here. Another exciting part of the SME Assembly 2017 will be the live finals of the Youth Essay Competition, during which the top three entrants, Evlampia Karavangeli, Oksana Vedmidska and Pavle Kostic will be presenting their ideas to the Assembly delegates. We wish them the best of luck with their final preparations before next week! Not one but two live finals! The SME Assembly 2017 will also play host to the semi-finals for the latest Ideas from Europe search, which will result in a live announcement of the Ideas from Europe finalists on the final day of the Assembly. Be sure to follow us on all our social media platforms to get live coverage from the event including exclusive quotes, pictures and other exciting updates! The day we have all been waiting for has arrived: We know who is on the EEPA 2017 shortlist! The day we have all been waiting for has arrived. Continue reading to find out who made it! This year the Youth Essay Competition received almost triple the number of essays in comparison to the first edition back in 2016. The EEPA Jury are busy reviewing all of the essays, so stay tuned to the Promoting Enterprise Portal to find out who the shortlisted candidates are in October. Enjoy reading this edition of the SME Week Newsletter and be sure to follow us on social media and on the portal for all the latest updates. Is youth entrepreneurship really happening? How is the Union aware of what innovations youth are working on, or whether they are being supported adequately? The following report provides insights into youth work and their necessary entrepreneurial learning and development. The EU and its Member States have been promoting entrepreneurial competences among young people as a pathway to taking an active part in society. This report presents the findings and conclusions of a major study which mapped, described and analysed the contribution of youth work to supporting young people to become active and entrepreneurial citizens of Europe. The report delivers concrete recommendations for policymakers, as well as for the formal education sector and for youth work organisations, on how to increase the impact of young people’s entrepreneurial learning. Youth Essay Competition 2017 – What’s next? The Youth Essay Competition 2017 submission period is now closed. Thank you to all the participants for all your hard work! This year the competition is getting even tougher, with submissions from across 23 countries and triple the number of entries from 2016. 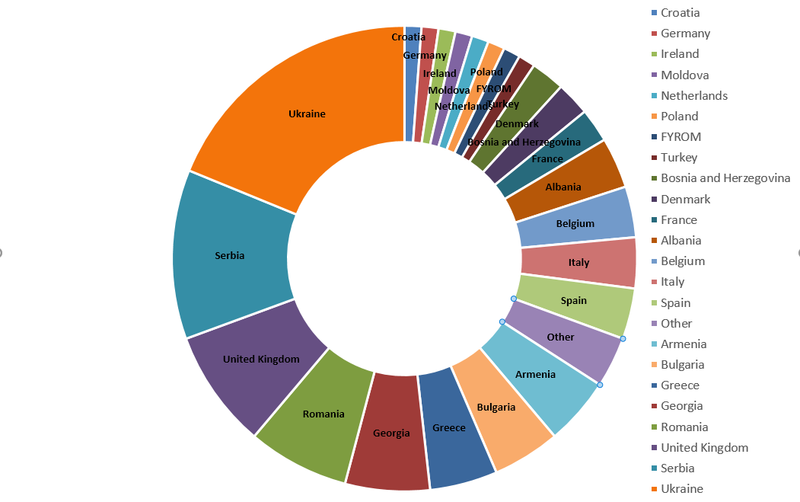 This year the top three countries were Ukraine, Serbia and the United Kingdom. We also received entries from Russia, Egypt and Nigeria. Unfortunately we can only accept submissions from citizens of COSME countries, but thank you for sending us your ideas! The Essay Competition jury will now deliberate and read through the entries to determine the top three submissions. These top three finalists will be announced right here on Promoting Enterprise and across all our social media in the middle of October, so make sure to follow us to be the first to know! The final step of the competition involves a live finale in Tallinn at the SME Assembly 2017. Each of the three finalists will present their essay to the 500+ Assembly delegates and the winner will be selected via a public vote. Each finalist will win an all-expenses paid trip to the SME Assembly 2017 in Tallinn, Estonia, be given special presentation training before the event and finally have their essay and ideas promoted right here on Promoting Enterprise and across all our social media. Who were the 2016 finalists and what did they have to say? Read about Andri, Katie, Frici and Francesco. Curious about who will be judging your entry? Meet the Jury!